Objective of visit: To collect high-resolution data on the current extent of the ancient remains as well as the elevation of Kom Aushim (Karanis). Fellow visitors: A multi-national, multi-disciplinary team of scholars and scientists, directed by Dr. Willeke Wendrich (UCLA, USA), Dr. René Cappers (University of Groningen, the Netherlands) and Dr. Simon Holdaway (Univeristy of Auckland, New Zealand). 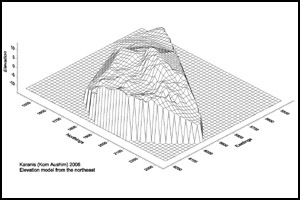 A dataset of three-dimensional coordinates and a preliminary elevational model of the central part of the site. These will be integrated in the virtual reality model of Karanis that is under development as part of a site management program initiated to preserve and present the site more comprehensively. A measured plan of the site has been completed using a Topcon total station and DGPS as well as ArcMap (ESRI), AutoCAD (Autodesk), Foresight DXM (TDS), GPS Pathfinder Office (Trimble) software. 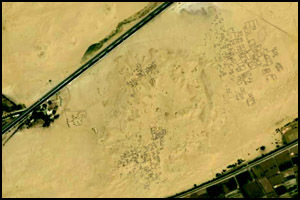 Approximate position and date of the site: Karanis is located at the northern edge of the Fayum depression, just south of the desert road to Cairo, Assyut and Alexandria, in an area now known as Kom Aushim. The ancient remains are of a major Graeco-Roman city (3rd century BC-6th century AD). Large amounts of grain and olives must have been processed at the site before being transported to Alexandria and Rome. Short description of the site: Karanis was an important town in Graeco-Roman times, when the Fayum depression was developed for agriculture to help feed the Ptolemaic, and later the Roman armies. The main economic purpose of the town seems to have been the production of olive oil. Large parts of the two sandstone temples, devoted to Sobek, Isis, Serapis and Jupiter, are preserved. The majority of the structures , however, are of mudbrick and have suffered dramatically over time. Not only are they damaged by erosion from the desert wind, but they have also been mined at an industrial scale to be rehydrated into fertile soil. A number of archaeological projects have worked at the site, most notably that of the University of Michigan in the 1920's and 1930's. The importance of the site is defined by the large amounts of textual material (papyrus, ostraca) that have been unearthed. These remain an important source of information until today. A small site museum shows some of the finds from the area. Karanis is now within the concession of the UCLA-RUG-UoA Fayum Project. My participation in this project would not have been possible without the support of the Fayum Project, the Cotsen Institute of Archaeology and many individuals.